If Sesame Street sponsored the 2012 Georgetown football season, unquestionable it would have been brought to you by the number 5. 5 as is in: number of wins, a 5-6 season. But more unusually, though, 5 was also the number of quarterbacks that attempted a pass for the Hoyas last season. An incredible run of injuries at the most important position on the field saw the Hoyas fall back to a 5-6, though they did win two out of their last three games, including their third straight over Lafayette, 20-17. The Hoyas will always bring a strong defense to the table, as always. 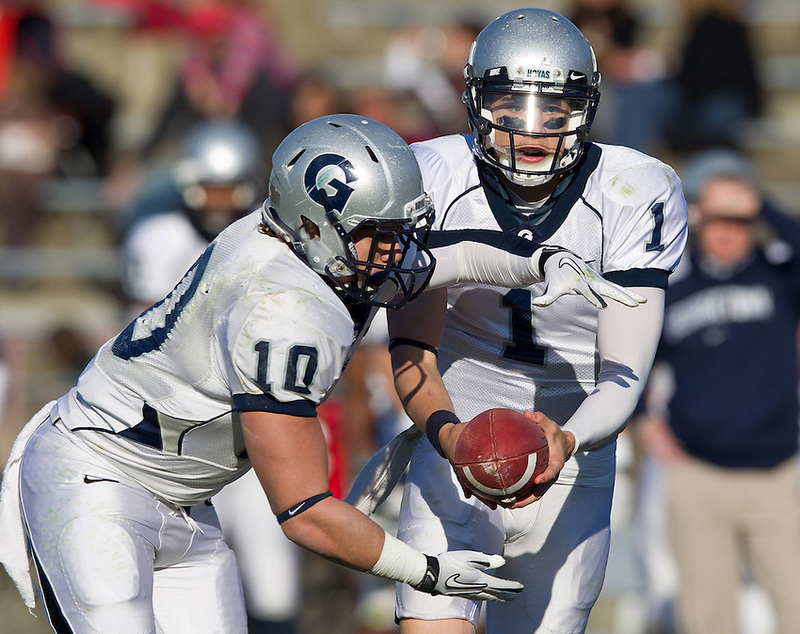 But this year, Georgetown's title contention hopes most likely rest in the hands of senior QB Isaiah Kempf - and hopefully not four more quarterbacks. At Patriot League Media Day in 2012, Kempf was very eager to prove the critics wrong that the Hoyas could not continue their run of title contention. Unfortunately, though, the senior would not get the chance. On the first drive of the year against Davidson, Kempf suffered a concussion and did not return for the rest of the season, despite Georgetown's 35-14 victory over the Wildcats. Fans of some teams talk about adversity in regards to, say, maybe losing a game they were expected to win. In the Hoyas' case, though, as starting QB after starting QB fell to injury, the adversity was very real. By the time the Hoyas faced off against Lehigh last season, the Hoyas were suiting up third-string QB Stephen Skon, who could only manage one offensive touchdown for the Hoyas in a 17-14 Lehigh victory. It was a strange game where Lehigh dug themselves in a giant hole with seven turnovers, but somehow rallied to win the game in the second half. The Mountain Hawks - astoundingly - overcame seven turnovers, including four interceptions from QB Michael Colvin, and then hung on to win on after the Hoyas final 37 yard field goal attempt was partially blocked by DE Tom Bianchi in the closing seconds. Like so many of Lehigh's wins this season, it wasn't for the faint of heart. Of the Mountain Hawks' seven wins this year, five have been determined in the last three minutes of regulation. And including this Saturday's game, three have been determined in the last ten seconds of the game. Thankfully for Lehigh, two of the architects of last season's defense that generated all those turnovers, Patriot League Defensive Player of the year LB Robert McCabe and CB Jeremy Moore, graduate this season. Standout senior LB Dustin Wharton (104 tackles, 3 1/2 sacks, 7 pass break-ups) and senior DE Sean Campbell (52 tackles, 3 sacks, 2 forced fumbles) do return, however, which indicates that the Georgetown defense will continue to be the fearsome unit they've always been. But it's not the defense that has coach Kelly animated this summer. This was the best the offense has looked in a scrimmage since I've been at Georgetown. As we walked off the field on Saturday afternoon, one of the officials commented that he thought it was the sharpest he's seen a Georgetown team look in the years he's seen us. Isaiah Kempf had an excellent day and the offensive line, as a group, did a great job in protection. Senior TE Dan Sprotte made several big catches and was a reliable target for our quarterbacks. Freshman RB Tyrell Williams showed that he is going to be a factor for this team early in his career. Last season with all the turmoil it was a season of adjustment but there will be much more continuity with Marino's physical, run-tilted offense. Sprotte really came on as a target for the Hoyas later in the season in offensive coordinator Vinny Marino's system, notching 15 catches for 134 yards and 1 TD, complementing the rushing attack of senior RB Nick Campanella (501 yards rushing, 9 TDs) and senior RB Dalen Claytor (284 yards rushing, 1 TD). Another Hoya silver lining from all the adjusement was that it allowed a true freshman, 6'5 sophomore QB Kyle Nolan, to start for the Hoyas and show head coach Kevin Kelly what he could do. "It will be a competition for the starting QB position," Kelly said at Patriot League Media Day. In general, Georgetown gets a bad rap from Patriot League fans. The Hoyas have never won a Patriot League championship or qualified for the FCS playoffs, despite an 8-3 record in 2012. Part of the reason is the stink of a decade of futility. From 2000 to 2010, Georgetown never had a winning record, notching an awful 0-11 and a terrible 1-10 season during that span. But most of it - unfairly - comes from the stigma of continuing to mostly offer need-based aid instead of fully funding football scholarships. What's interesting is that this stigma has continued despite the fact that, in the last several years, Georgetown has been every bit in the hunt for the Patriot League championship. Objectively, in the last three seasons, Georgetown has owned Lafayette - winning three straight - and also gone 2-1 against Holy Cross over that span. They've beaten Colgate, Fordham, and Bucknell, and came within a whisker of beating Lehigh twice in the past three meetings. In the last two years, Fordham - who was supposed to run over Patriot League competition thanks to the fact that they're offering conventional football scholarships - went 7-15. Georgetown went 13-9, including a win over Fordham in 2011. And take last year's 5-6 record. Technically, Georgetown finished in second place, one game out of their first-ever Patriot League title in 2011, and were in a 3-way tie for 3rd place last year with Lafayette and Holy Cross. Objectively, that's just a rung below the class of the Patriot League the last two years, Colgate and Lehigh. So why do people keep underestimating Georgetown? In this reporter's opinion, underestimating Georgetown would be a giant mistake. Maybe in the 2000s you could count on the Hoyas being a walkover victory, but not anymore. It will be a surprise to many when Georgetown contends for the Patriot League title yet again, but not me.